Get silly with poppin’, droppin’ colored balls! Pump the plunger and drop the balls onto the spiral track. When they reach the bottom, look out – the balls pop out the top! Giggles are guaranteed with eight lively songs to help keep the fun rolling along. And later, when baby’s a bit older, there’s even more fun to be had by chasing after the bright, busy balls! Includes ball popper base, output tube rack, tray, lower trough and five balls. Copyright 2008 Hasbro. All Rights Reserved. The Playskool Explore and Grow Busy Ball Popper is a great put-and-take adventure for your infant or toddler. Designed for children ages nine months and up, the Busy Ball Popper will have your child popping the bright, colorful balls into a fun frenzy as they are air-popped out of the lower tube. 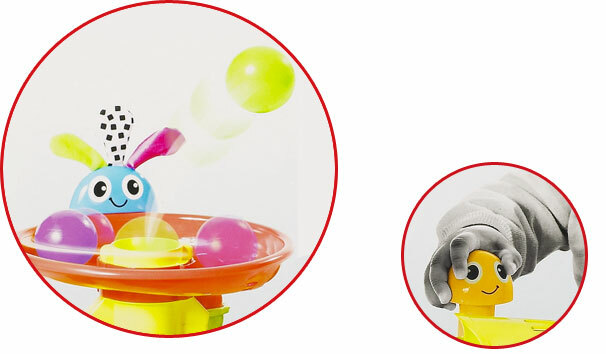 The ball spinner/popper provides a fun sensorial experience, and includes fun, upbeat music to match the bright colorful characters. The Good: An exciting sensorial, put-and-take toy for your infant/toddler. The Challenging: Could be damaged if dropped or thrown repeatedly. In a Nutshell: A colorful toy that pops balls into the air or onto the ground for chasing. Watch the fan pop the colorful balls into the air! View larger. 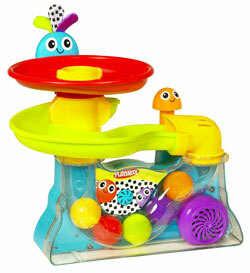 The Busy Ball Popper is a one-piece toy that’s made up of a removable ball trough, tube, and tray. When your child presses down on the big-eyed mushroom character on the Ball Popper, the balls move up the tube and pop out of the top, falling back into the tray to start the process all over again. The popper is made to withstand the rigors of your infant’s play and can be easily cleaned with a damp towel. The plastic balls are large enough that you will not have to worry about them as choking hazards, but when your child is popping the balls, make sure to keep an eye out for balls as they can go off of the track occasionally. The popper also includes eight lively songs that start once you have pumped down the plunger to activate the ball-popping fan. Keep in mind that although the Busy Ball Popper is made out of a strong, durable plastic, it is fairly heavy and should be kept on a flat surface while being played to avoid any damage to your furniture. The toy also shuts itself off after a short period of time, but it is recommended to always turn it off manually for battery conservation. This ball popper is a great toy for infants gaining gross motor skills, or for toddlers who are ready to chase the balls around the house and dance to the upbeat music. It is visually appealing with its bright, colorful balls and characters, and you never know where the balls may land, making it an exciting and new adventure each time. I almost didn’t buy it!!! Don’t listen to the bad reviews! I’m the type of person who reads almost every review before buying anything, and there were a couple comments mentioned by MULTIPLE reviewers that almost made me not buy this toy!These bad comments were (NOT my opinion):1. The toy is dangerous — child’s arm got stuck in the hole where balls shoot out from.2. The toy is VERY loud and a potential danger for small developing ears.3. The small balls are a choking hazard.I decided to give it a try cause I could always return it, well I’m KEEPING it!#1… the toy that I got is the updated version that now has “prongs” on the inside of the tube, so there’s no way a child can get their arm stuck down there.#2… the toy is NOT as loud as most of the reviewers describe it to be. When I got it, I thought it was gonna sound like a vacuum cleaner from all the comments! It doesn’t — it sounds like a muffled hair dryer. Louder than any toys he has, but FAR from deafening!#3… the balls are a little bit on the small side. I tried putting the balls in my mouth just in case, and I really had to open wide! I don’t think a small child could fit them in their mouth. In any case, I wouldn’t let my son play with this toy alone anyway. It’s not that big of a deal.The amount of fun my son has far outweighs any of the negatives (if you can call them that) of this toy. I happen to think it’s perfect!!! And I’m so happy I ignored all the bad reviews! This was our kids’ favorite toy for years. I bought this one as a gift for a one-year-old and it was the hit of the party. When the balls hiver at the top of the chute and then pop up and out, it’s fascinating and makes babies giggle. Babies motor goes a for a minute or so and then turns off so baby learns to press a big button to turn the machine on. Sometimes the balls will gently pop out of the machine and other times, they pop up wildly, so it’s never the same twice. Some reviewers say there aren’t enough balls, but there are plenty and baby learns to go retrieve them to put back into the chute. I like this model better than the more recent version, I guess because it’s simple. We never had any problems with the blower and while we did have to retrieve a few errant objects out of the machine, it’s reasinably easy to do, and yet another learning experience for the child. My only wish is to get back the original packaging so when we give this as a gift, it doesn’t look like we bought it second-hand. An older version of this toy was a huge favorite of my kids when they were young. I purchased two for my niece and nephew. One didn’t work (fan seemed to be jammed, it emitted a burning plastic smell) but the other worked great. Getting a replacement was no problem thanks to Amazon 🙂 Music isn’t too loud and even my big kids had a good time scrambling after the balls as they flew out. Hoping my niece and nephew enjoy these as much as my kids did (and apparently still do)! This. Toy. Is. GREAT!We bought this for our youngest’s first birthday. It was a hit with him AND with his three year old brother! Now, about two months later, they both still enjoy it. (Of course, the three year old tires of it more quickly. )-It requires D batteries (4, I think), which do not come with it.-It only runs for something like 20 seconds at a time, but our one year old only had to see us push the big button a couple of times before he understood how to push it and play independently.-Some people have called the balls a choking hazard. Uuuummmmm. I don’t know what kind of freakishly huge mouths and throats their kids have, but there’s NO way any kid I’ve met could choke on these.-It was quick to set up wen I got it. I had it going in less than 10 minutes, and most of that time was finding and installing batteries.-Sometimes when it’s running, the vacuum to keep the balls flowing just doesn’t quite happen. The usually fixes itself after it stops and you start it again, but my husband discovered that you can also get it going by blocking the “out” hole with your hand for a second or two. The balls get sucked in a little farther and start flowing as usual.-After two months the batteries still haven’t needed to be changed.It only comes with 4 or 5 balls. That’s enough… Until the kids lose them around the house. I recommend ordering a pack of the extras at the same time. They’re handy for indoor play, anyway. The kids can toss them around all they want without us telling them not to throw balls in the house. My baby is slowly warming up to this toy but it scared her half to death when she first started using it. The balls do not nicely circulate through the course – they fly out all over the place. It terrified her. Now she will go get a ball and put it back in but the balls flying everywhere is super annoying. I had a toy very similar to this for my older kids but the balls did not shoot out. They circulated through the course as expected. I’m pretty disappointed – the only plus is she likes to press the thing to make it play music. Speaking of the music – it is SUPER loud!!!! ***Update**** Kiddo is almost two and this is still one of his favorites! It takes 4 C Batteries. The replacement star bright balls kind of get stuck. It is certainly strong motor. My kid is at the age he likes to put anything in there just to see if it’ll pop out. Sometimes it works other times we find my husband’s missing glasses. He can find 20 minutes of entertainment with this toy. The balls can float outside in the pool or in the ball. I wish they created one for his current age. Regardless, I see him playing with this at least 8 more months****Original******* This toy is wonderful. It amazes my 6 month old. I even throw the balls onto his play mat for him to learn how to grasp . I forget how much I payed but feel it’s a good toy.